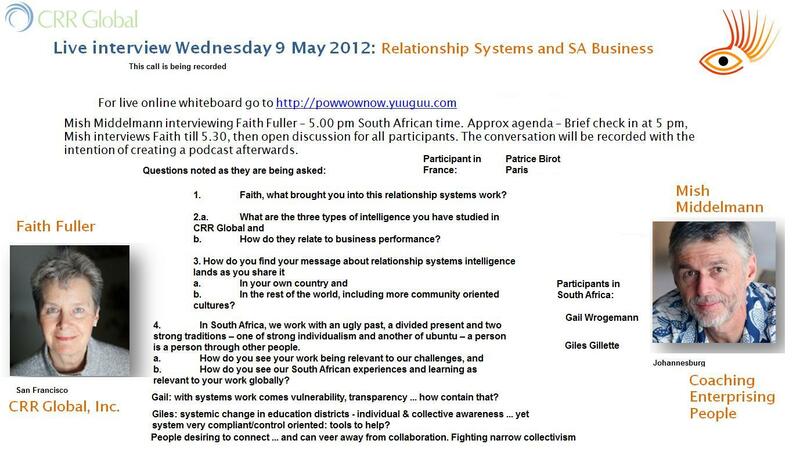 This is a combined text/audio posting based on a fascinating live interview with Faith Fuller, President and co-founder of CRR Global, Inc on the topic of Relationship Systems and South African Business. In keeping with our recent focus on global virtual teams, we held the interview via teleconference from Johannesburg to San Francisco, with interested colleagues and potential clients joining the conversation from around South Africa and France. We also used a shared whiteboard (click on the image to the right to see it full size) to keep the focus of the conversation in front of the dispersed participants. Faith Fuller has been working with teams and relationships at work for the last 18 years. During this time she has created a powerful ICF-accredited training system in Relationship Systems Intelligence (RSI) and taken it all around the world, as well as consulting to top global businesses and nonprofits, together with her SA-born partner Marita Fridjhon. The resonance I feel with their work is the linking and balancing between task and relationship. This is where I see the generative opportunities arising from the mixing of our cultural heritages in South Africa. We want ubuntu and we want prosperity! In the clip above, Faith Fuller outlines the key strands of systems knowledge and understanding woven together into the model and programme known as "ORSC" for "Organisation and Relationship Systems Coaching," and how they apply to business and private partnerships, teams and whole organisations. Together in conversation, we explore the way their work helps leaders and coaches shift their focus from the individuals making up a partnership or team - to the entire connected entity, the partnership or team itself. The next audio clip tackles the question of "so all this relationship systems intelligence sounds nice and warm and fuzzy, but what's the business benefit?" 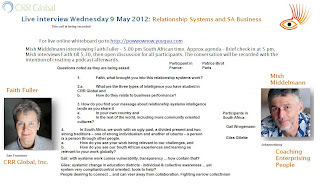 In essence, Faith Fuller lays out the business case for developing social intelligence and relationship systems intelligence (RSI). In the 4-minute clip above, Faith details what it costs business not to tackle relationship issues, and the benefits to businesses of getting really good at working in differentiated, interconnected teams - specially in diverse societies like South Africa . Next, we explore the mixed heritages of South Africa - individualism and ubuntu - and how we can lead the way in bringing a balance between the two, that is needed by business worldwide. Faith draws on her experience working around the globe in its most individualist and most collectivist cultures and concludes that in more community-oriented cultures people often "...don't have a voice ... often don't take much of a stand, rather wait and see what the group will do." She notes that people with this cultural preference often ending up for example with unpopular governments, and sees on the other hand that "in highly individualistic cultures ... everybody's got their voice and nobody's listening". She ends with a powerful systems vision for business to find a balance between these extremes - and an important role for South Africa at the forefront of tackling the tensions arising: click the Play button below to listen (3 min). Some of the practical skills taught on the ORSC Fundamentals and ORS@Work courses include "Alignment Coaching". In this excerpt the conversation broadens to include coaches and consultants in South Africa and Europe, and Gail Wrogemann explores tools for large group mediation work with Faith. Your comments are welcome - please click the orange "comments" link below to activate.